Unveiled on Alumni Day, June 11, 1929. 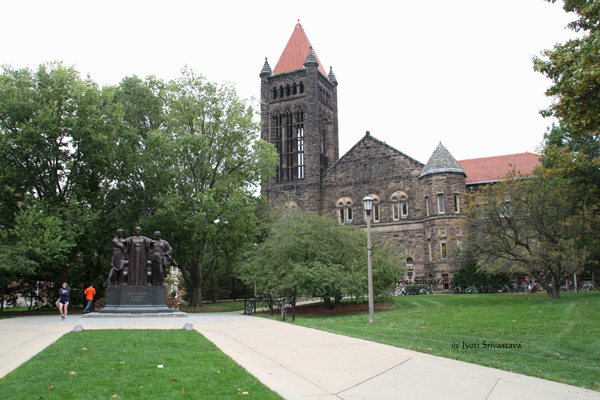 Location: UIUC Campus, Altgeld Hall corner of W Green St. and S Wright St. 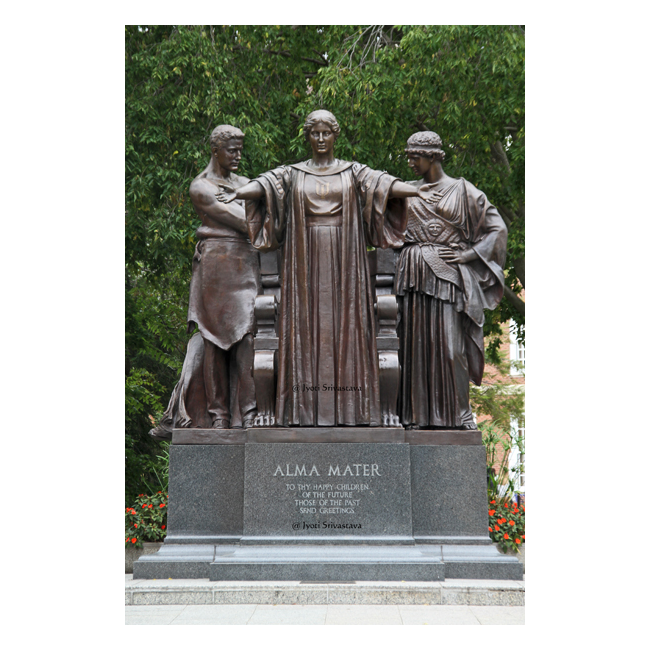 The sculpture “Alma Mater” was created by Illinois alumnus Lorado Taft. The 13-foot sculpture was unveiled on Alumni Day, June 11, 1929. It was paid for by the alumni fund and classes of 1923-29. Originally placed south of Foellinger Auditorium, it was moved to its present location at Wright and Green Streets in 1962. 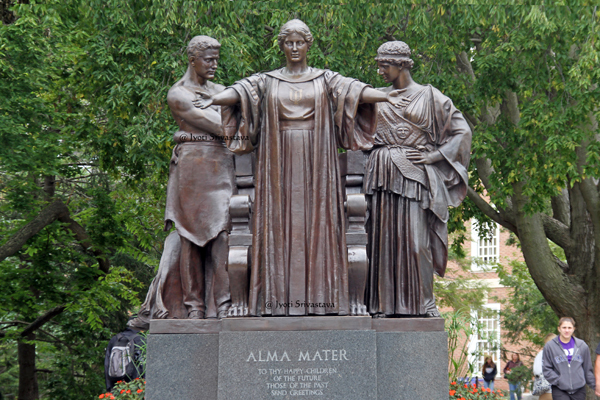 The bronze sculpture has four main elements: Alma Mater, “Our Mother,” a woman with outstretched arms welcoming her children; “Labor,” an iron worker wearing a leather apron; “Learning,” a modification of a Greek statue of the goddess Athena; and the klismos (throne) behind Alma Mater. 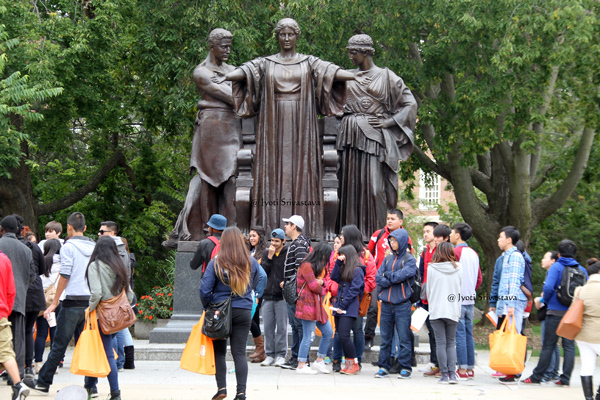 From the website.. University of Illinois, Virtual Campus Tour.. The statue depicts “a benign and majestic woman in scholastic robes, who rises from her throne and advances a step with outstretched arms, a gesture of generously greeting her children”. Behind her stand the twin figures of Labor and Learning, joining hands in a bronze incarnation of the University’s motto .. Learning and Lobor. In August 2012, Alma Mater was shipped to the Conservation of Sculpture & Objects Studio in Forest Park to repair decades of water damage and corrosion. Lead conservator Andrzej Dajnowski and his team took much of the sculpture apart in order to replace nearly 1,000 bolts used to hold the sculpture together. That included removing the heads of the three figures: Alma, Learning and Labor. The blue-green patina was removed with lasers, and the metal sealed with a wax compound. The true color is actually a bronze-brown. The estimated cost of reburbishment more than tripled, from just under $100,000 to $360,000. In April 2014, the refurbished Alma mater was returned to the university campus. 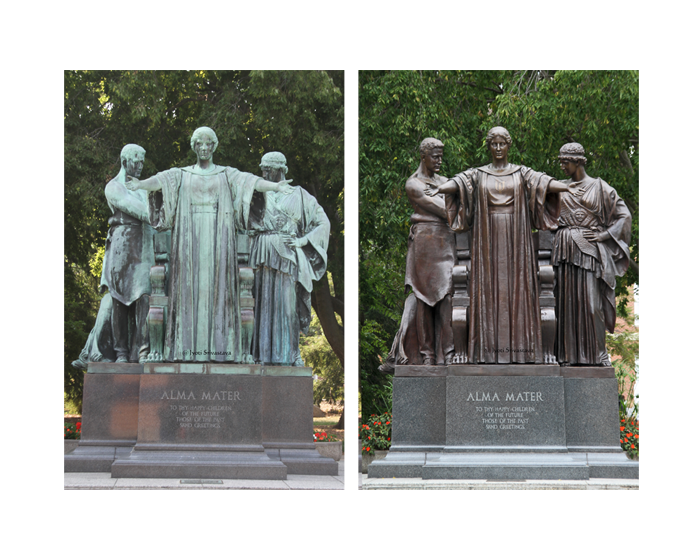 Images can be found in Chicago Tribune article.. “Alma Mater return to the University of Chicago”.. click here..
Alma Mater – by Lorado Taft / Before and after: July 2012 and October 2014. 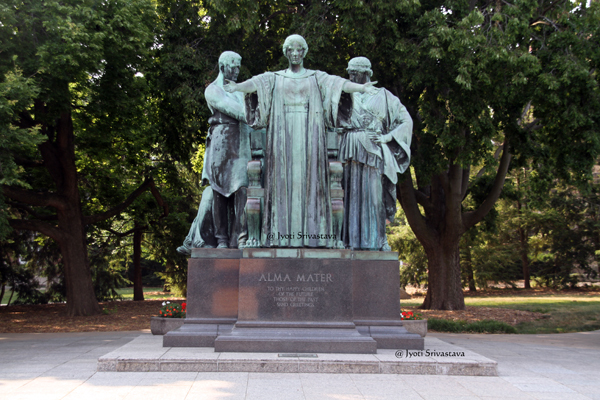 Alma Mater – by Lorado Taft / July 2012. 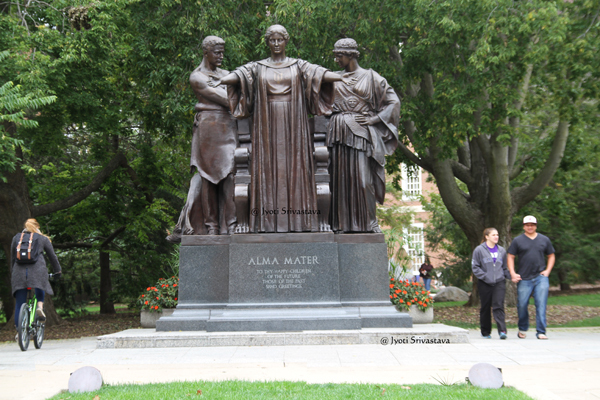 Alma Mater – by Lorado Taft / October 2014. 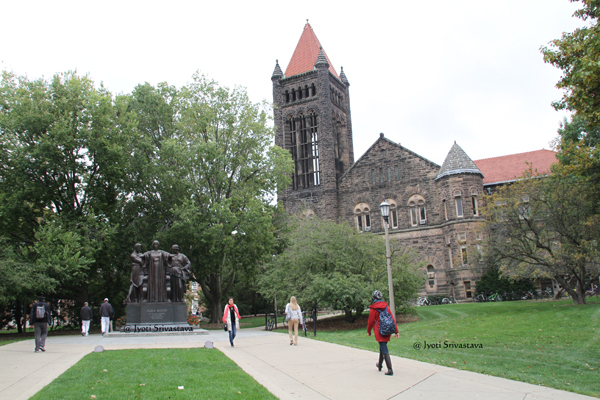 Exploring Urbana-Champaign, Illinois… click here.. Exploring Home State Illinois.. click here..
My Vacations Photo Gallery.. click here.. Vacation: USA / Illinois.. click here..
UNESCO World Heritage Site.. click here..